When you’ve finished building your brand-new wood fence, you’ll be faced with the decision of which topcoat you should go with: paint, stain, or bare wood? Stain is often the choice of many since it can offer the same aesthetic appeal as paint or bare wood but also offers protection for your wood fence. If you like the look of a bare fence, then you can opt for a transparent or semi-transparent stain in a natural colour that’ll allow you to see the grain of the wood. This way, you’ll be able to protect you fence against rot, insects, and normal wear and tear. Stains come with a lot of the same benefits as paint but without any of the downsides. Paint doesn’t work well with all types of wood and tends to chip, peel, and show signs of wear and tear in as little as a year. However, stains can last a lot longer. If you need to repaint you fence in a year or two, you’ll need to scrape away the peeling paint before you can begin. Whereas with a stain, you can simply clean it and reapply the stain, making it a fast process all around. If the main reason you were debating between paint and a stain is because you want to add some colour to your wood fence, all you need to do is purchase a solid stain. You won’t be limited to just variations of brown—they also come in vibrant colours like red, blue, green, yellow, pink, and more. Overall, there are a ton of reasons why you should choose to stain your fence—from protecting your wood fence to making it aesthetically pleasing, there aren’t many downsides. Keep on reading to find out about one of the easiest ways to stain your wooden fence. The easiest way to stain a wood fence is to use a low-pressure paint sprayer. This eliminates the need for sponges and brushes and allows you to apply an even coat every time—not to mention, it can be a lot faster. However, if you don’t think you’ll have much use for an electric sprayer and don’t want to dish out the cash to buy or rent one, there’s nothing wrong with using a good old paint roller. While it’s not the easiest way to stain your fence, it is still effective. 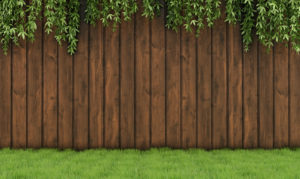 If you’re using a paint brush or roller to get the job done, you may be wondering how to stain your wooden fence without damaging nearby greenery. Simply drape cloths on the ground and over nearby surfaces to protect them from paint splatters. When it comes to re-staining your fence, follow the same process—just be sure to clean it thoroughly before you begin. Total Fence Inc. specializes in residential and wooden fencing services. With the technical expertise and work experience to support it, we’ve become one of the preferred fencing and deck-building contractors in the Toronto area. We build, repair, and redesign both residential and commercial fencing—whatever you need, Total Fence Inc. can do. Visit our main web site today to request a free quote.